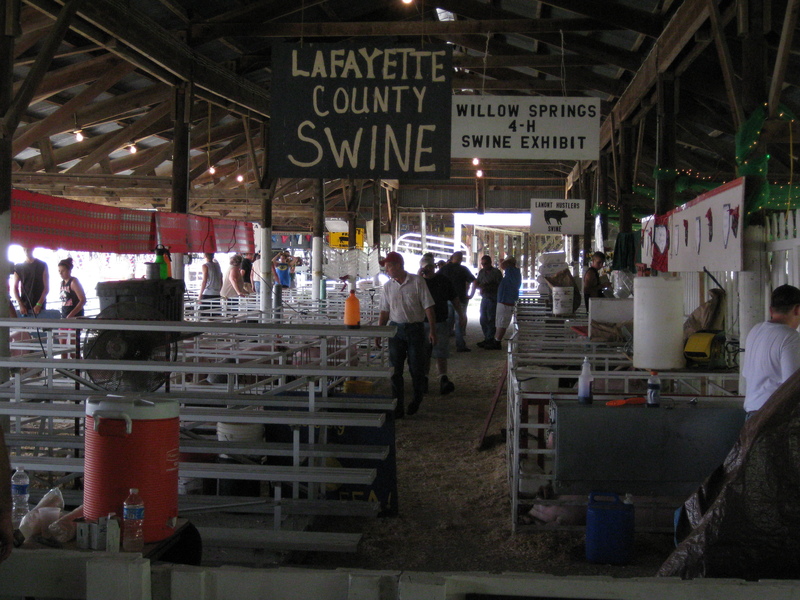 Swine barn, Lafayette County Fair. Because of my background as a certified swine ultrasound technician, the fair superintendent asked me to line-up a technician. 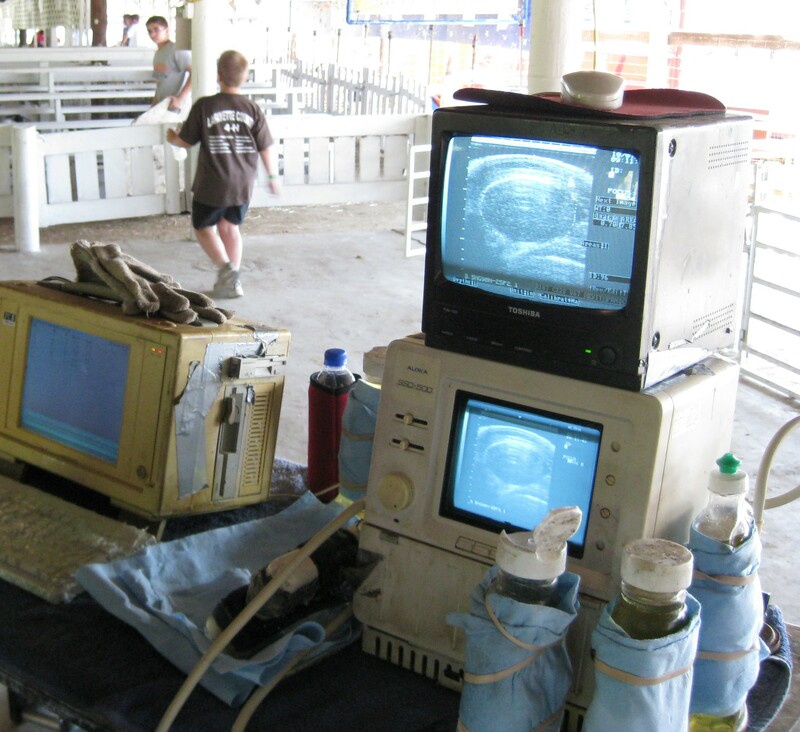 Ultrasound is used to evaluate a hog’s carcass. Below is a picture of the technician with the probe on a hog’s back. 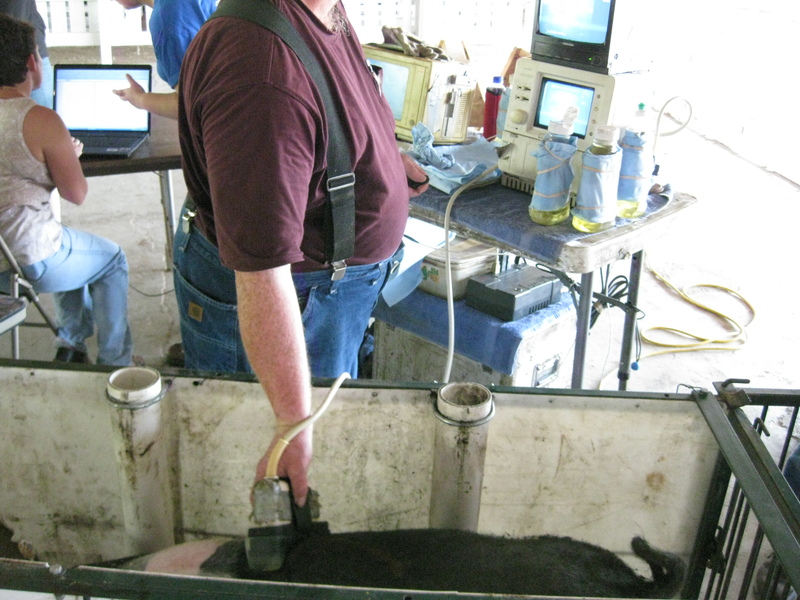 The information is entered into a computer and a formula is used to rank the hogs on percent lean. The measurements taken are backfat and loin muscle area. These two statistics, along with the weight of the hog, are used in the percent lean formula. Look at the screen in the picture below and see if you can see the layer of backfat above the roundish loin muscle area, (pork chop). Also visible is a rib in the lower right-hand corner. Even though I used to be an ultrasound technician, I miss the old days when we actually measured the carcass. We would show our hog at the fair on Friday. Sell it at the auction on Saturday. Load it onto the trailer on Sunday. And see it’s carcass hanging on the rail on Wednesday. This entry was posted on Friday, August 6th, 2010 at 1:12 am and is filed under Curious farmer, Curious hogs. You can follow any responses to this entry through the RSS 2.0 feed. You can leave a response, or trackback from your own site. Are the bottles of liquid in front of the ultrasound equipment some sort of oil or lube used on the back of the pig for sonic conductivity, sort of like they do with pregnant women? you reminded me of my local fair and the farm component…your sisters remark about her summer is hilarious. I can’t help myself. After adopting the WestonPrice way of eating, bacon is my very favorite meat of all time and I treat myself once a week. That’s plenty and color me happy! Yes, James, vegetable oil is used. Karen, sometimes it seems nothing changes here, but ultrasounding swine shows change does happen. I remember one time when we transported a hog and bale of hay i was astonished the pig consumed the entire bale.